NSF is committed to maintaining the U.S. status as the worldwide leader in innovation. NSF is pleased that the administration hosted this year's Community College Innovation Challenge event. 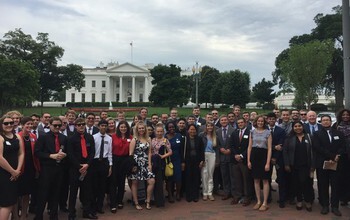 CCIC requires months of work, training and learning from these students, and this visit to the White House was a wonderful way to honor their efforts. I'm impressed by the innovations these finalists created, and by the professionalism they showed in presenting them. I would like to personally thank the officials who took the time to meet with the finalists, including Representative Rick Nolan, Michael Kratsios, Jeff Weld, Chris Liddell, Jim Reuter and Walter Bumphus, president and CEO of the AACC. NSF is committed to maintaining the U.S. status as the worldwide leader in science and engineering innovation. Doing so requires empowering more of our nation';s students to pursue employment in science, technology, engineering and mathematics (STEM) fields. Community colleges present people with curiosity and ambition, invaluable options for learning and career training. We are proud to work with the White House, the AACC and a wide variety of additional partners to help prepare the next generation of U.S. STEM workers. The Community College Innovation Challenge is proudly powered by Skild.